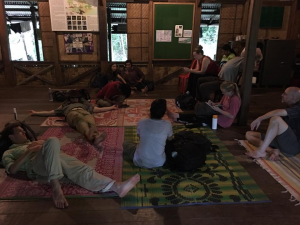 We spent the first two days of our Andaman Islands trip working and learning with ANET (Andaman Nicobar Environment Team). The days were long, beginning early in the morning and ending well after a late dinner, plus a long drive back to our hotel. Which didn’t have wifi or any other internet. In fact, the entire island was without cellular data (we could make phone calls but there was no data). We eventually found a couple of establishments with internet or wifi, but even then it was incredibly slow. Maybe in 2020, we were told by one resident and worker at Brewberry’s Coffee Bar. On the first day we left for ANET around 7:15 and arrived for breakfast. 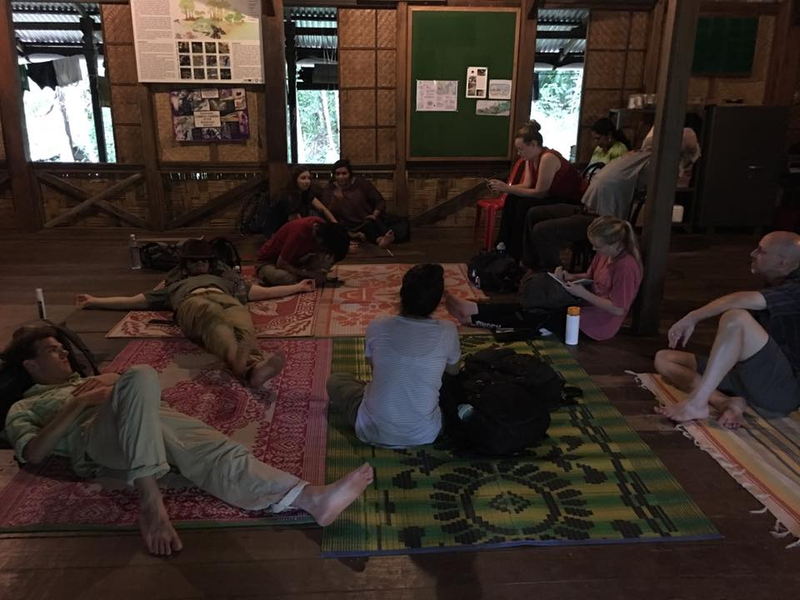 Our first lecture was an introduction to the Andaman and Nicobar Islands and the social, cultural and ecological context of our 2 day program. We then learned about mangrove ecosystems, after which we took a hike in the mangrove at low tide. The students observed behaviors of mudskippers and fiddler crabs, of which there were many of each. Fiddler crab males were attempting to attract female partners by using their claws to advertise the size of their home, according to scientists. The oversized claw is used in clashes of ritualized combat and courtship for females. After lunch we discussed observations, thought about experiments to test hypotheses about the behaviors observed, and had a lecture on marine turtle conservation. Both in situ and ex situ conservation methods are used. An example of in situ conservation would be observing where turtles are ovipositing and setting up exclosures to keep predators out and protect nests. Ex situ conservation might involve collecting eggs and bringing them to a safe place to hatch, and then rearing them for release. After an afternoon break we took a walk in the mangroves at high tide in the dark. We saw more fiddlers, but also hermit crabs, fish, eels, and couple of non-venomous snakes. No saltwater crocs, thankfully! Relaxing after a hike at ANET. Photo by Amy Brooks. Day two began very early, at 5:30 a.m. We went to the fish landing center to see the fishing boats returning to offload their catch, learn about the various species that were being caught, and watching sales of fishes to local markets or for export. 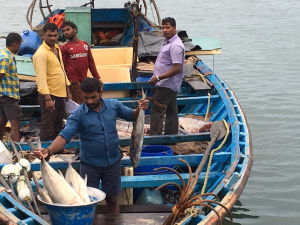 The Andaman & Nicobar Directorate of Fisheries is attempting to increase production of fish, having estimated that the current amount of fish landed is less than the potential yield, although it is not clear where that number comes from. We then went to the local fish market where we interacted with locals, asked questions, and learned about this part of island culture. 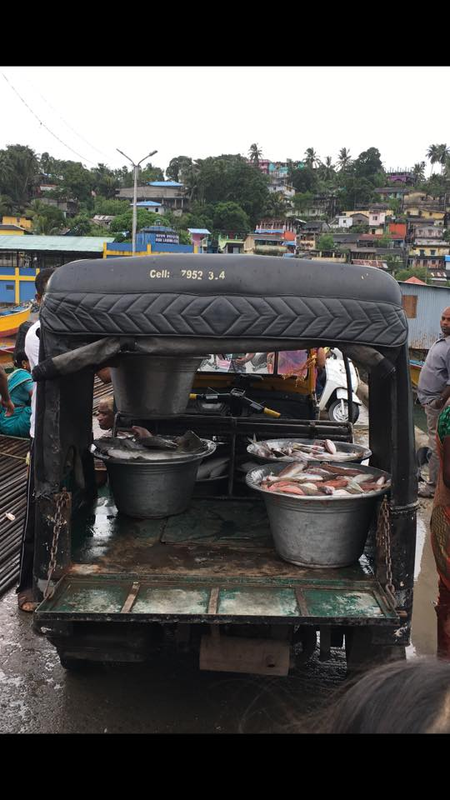 Fish being landed at the Port Blair Fish Landing Centre, Andaman Islands. Photo by Amy Brooks. 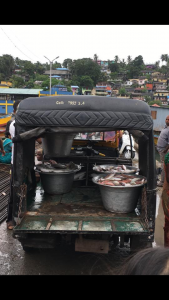 Fish being carted away at the Port Blair Fish Landing Centre, Andaman Islands. Photo by Amy Brooks. After breakfast, we discussed the visit and learned more about what we observed. We then went back to the coast, this time to a rocky intertidal area, where we saw more crabs, snails, other invertebrates, algae, and more. 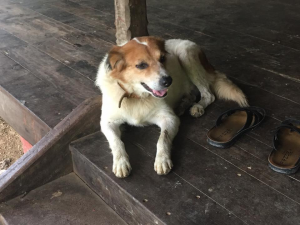 One of the ANET dogs (they had three pet dogs, which we were excited about because we’ve not been able to pet any dogs for two months) came with us. After our return to the base, we had a couple of lectures on the island inhabitants, cultures and challenges, from colonialism to the 2004 tsunami. This included a presentation by one of the staff members who is a descendant of colonists from Myanmar. One more late dinner, and then a return to our hotel ended the interaction. One of the dogs at ANET, Andaman Islands. Photo by Amy Brooks.